Having just come off watching True Grit, it was a real trip to see Jeff Bridges so young again. We can all use that kind of digital mastery. My amusement ended there. I guess if you are a gamer born around 1970 or so and thrived in dark video arcades with other social rejects in the early 1980’s, you will love this film. It has lots of cool special effects but only bland 3D effects. In fact, it probably set back the case for 3D by a few years—just when it was gaining immense momentum. The film would have been totally lost without Bridges adding some mystique. He might have actually saved it had he brought out a six shooter, started singing country music or ordered a White Russian. This film had a dumb plot and worse writing. Some lines were downright silly. Bridges uttering several lines about “destiny” laughingly reminded me of the goofball George McFly from 1985’s Back to the Future. I was also the only one in the theatre laughing out loud when I saw how Apple worked in a Mac 512K (versus the ever present Mac in most all Hollywood films). It was both genius and funny. Most of the sci-fi, plasticine faced gamers in the audience missed the joke while gobbling their gummy bears I guess. TMG has no real problem with the oddball sci-fi fantasy crowd, I just worry the ‘trekked out’ of society are working too many government jobs by day and doing weird things on their computers by night. To them, I simply suggest they do as this film finally suggests—come out into the sunshine and get some light. I fully admit though, I was never a “Tronner” or a video arcade geek. I thought video games pretty much achieved perfection with “Pong” and I retreated back to beer, hot cars and cool girls. It seemed more normal, natural and fun. Bridges plays super digital wizard of the virtual world, Kevin Flynn. He apparently cracks the code separating reality from Game Stop zombies and disappears into digital oblivion. His son Sam (played by Hedlund) follows a very bad tip from one of his father’s old cronies to find him. Sam leaves a very cool pad, a great Ducati motorcycle and cute dog to go looking for him. Why? Who knows? He ends up inside the digital world that his father designed right along with his father’s alter ego—a bad guy named “Clue.” Daddy Kevin Flynn isn’t even very happy to see him. After lots of “electric frisbee” and silly fighting, Sam gets back to reality. 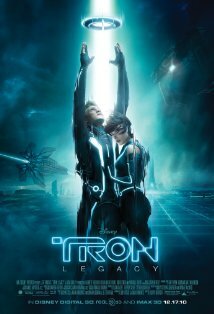 One bonus is he gets his Dad’s playmate and provocative digital femme played by the promising Olivia Wilde. This movie portrays quite convincingly why sons should never delve into their fathers past too far. The risk is not that it is revealing or dangerous. It is too often simply way too boring. The film ends without his father or the audience having a clue why they spent two hours watching it instead of Monday Night Football, or at least trying out the latest version of Halo or Call of Duty: The Dude Returns. I just thought that last one was funny and a great idea. You won’t find it in stores. Not yet anyway.